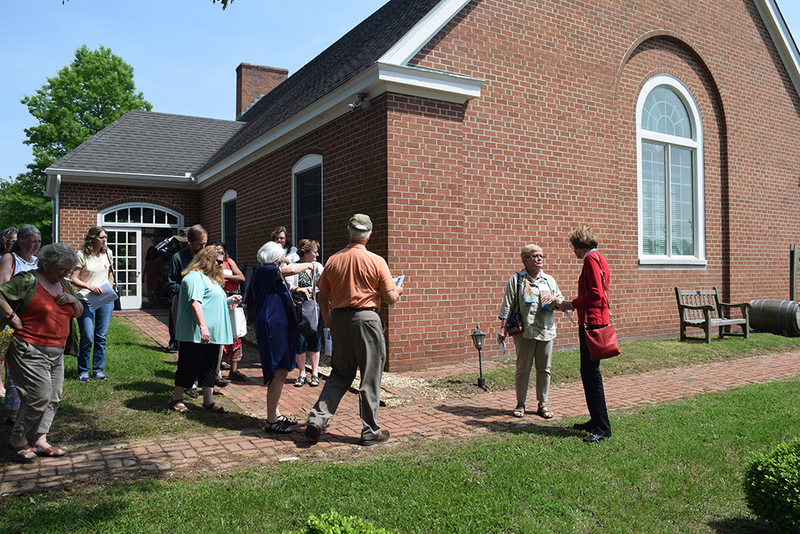 President Eileen McGuckian called the 26th Annual Meeting of the Coalition to Protect Maryland Burial Sites to order at 9:15 a.m. on April 29, 2017 at the Parish Hall of St. James Episcopal Church, in Lothian, southern Anne Arundel County, Maryland. St. James is one of the original colonial parishes, with the present church dating to 1765. The cemetery, also part of the original glebe that was granted in the earliest days to provide income for support of the parish, today consists of six acres. The graves of Christopher and Ann Birckhead (1666 and 1665) are believed to be the oldest dated gravestones in Maryland. Today there are more than 1,000 graves in the old section, with 4,000 sites available for sale in the new section of this beautiful property, which is listed in the National Register of Historic Places. 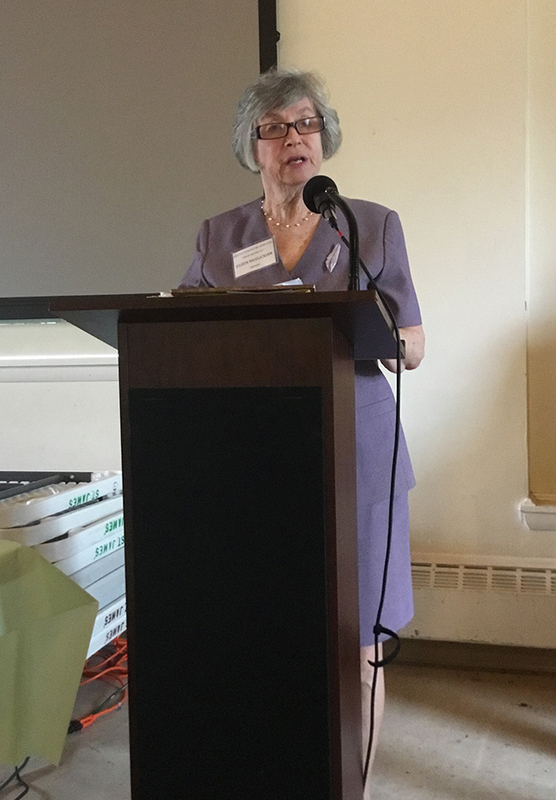 President McGuckian welcomed the 60 members and guests in attendance and reported her perspective on the state of cemetery protection and preservation in Maryland. The bad news is that hundreds of Maryland cemeteries remain neglected, vandalized, abandoned, and forgotten. In every county and town, they are in need of repair, maintenance, conservation, and even identification. 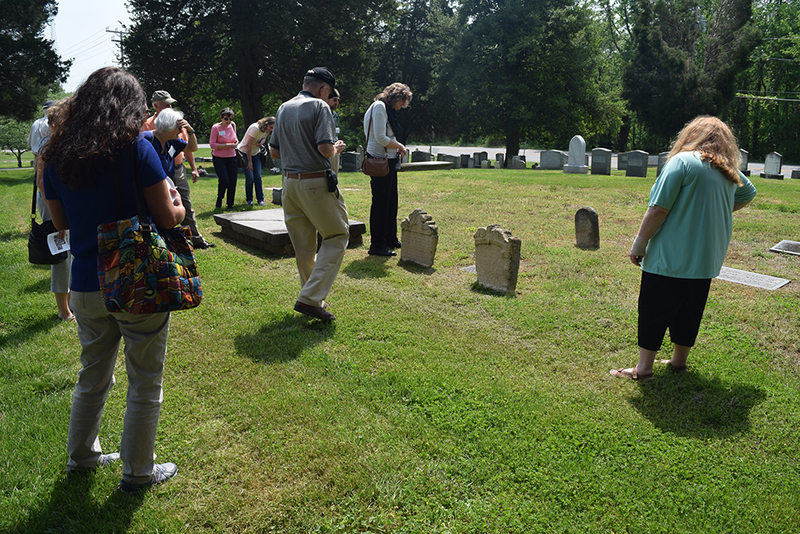 The good news is that interest in historic cemeteries is growing, through the attraction of genealogy and in burial grounds as historic places, with increased public awareness and partnerships, and with more tools and strategies available to protect burial grounds and to assist those who care about them. 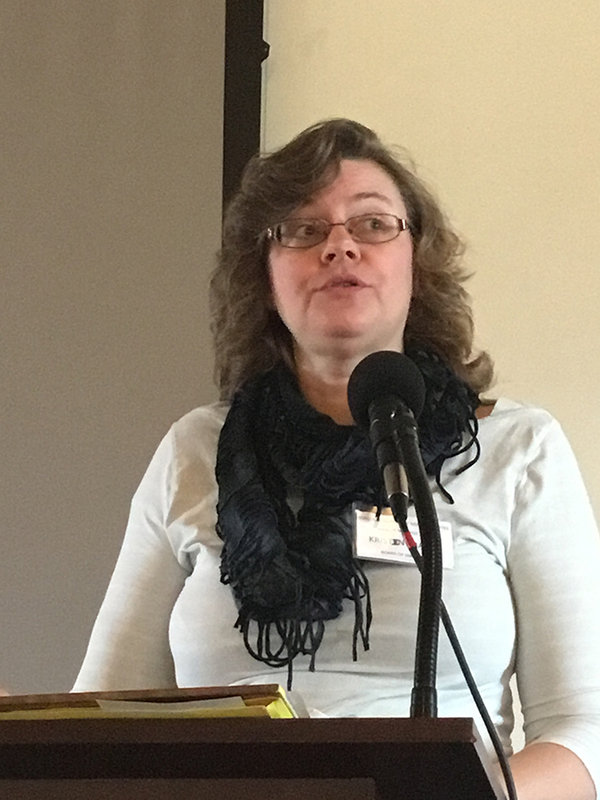 She described activities of the Coalition over the past year: re-designed website, serving as a resource for information and assistance, advocacy in multiple jurisdictions, creation of the Trader Foundation for Maryland Burial Sites to aid worthy projects, and the trend for cooperation between preservationists and cemeterians. 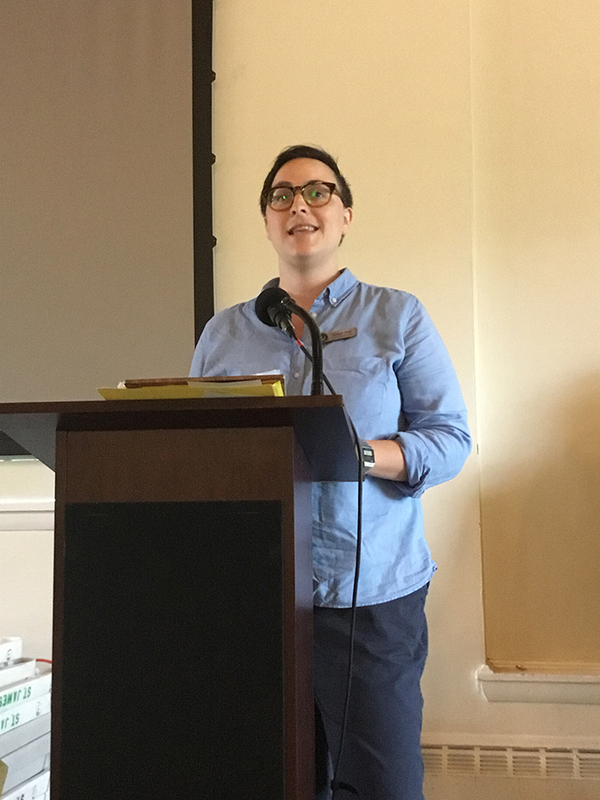 She particularly highlighted the Coalition’s partnership with Preservation Maryland as a Six to Fix project, and Meagan Baco of PM described the program and “Historic Maryland Cemeteries” project. Committee reports were presented by Treasurer and Outreach chair Dave Mills, Membership chair Kristin Kraske, and Trader Foundation director Glenn Wallace. John Higgins is retiring from the Board but remains president of the Trader Foundation. Amendment to By-Laws: Moved, seconded, and unanimously approved by CPMBS members present was the proposal to remove from Article III B of the By-Laws the sentence specifying scheduling of the Spring board meeting. 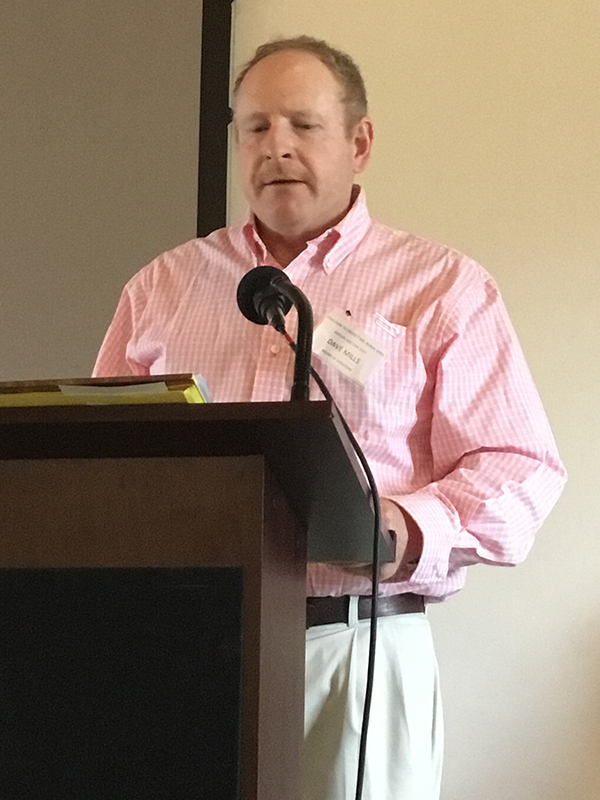 Dennis Montagna, director of the Monument Research & Preservation Program for the Northeast Region of the National Park Service, introduced institutional burial grounds in locations around the United States. 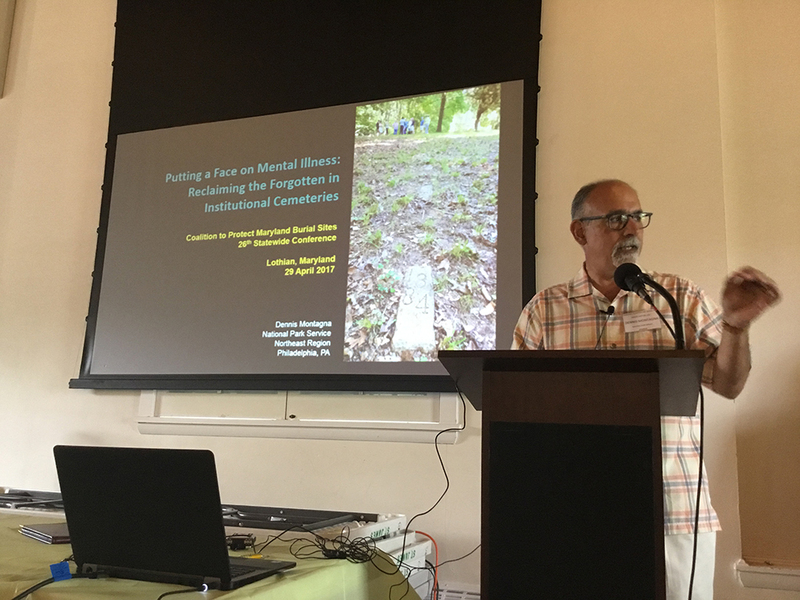 He discussed the need for and evolution of cemeteries on the grounds of facilities for the incarcerated, mentally ill, and individuals unable to care for themselves. He described how poorly records and markers were maintained and current attempts to memorialize these burials. Tina Simmons, cemetery inscription chair for the Anne Arundel Genealogical Society, then related the subject matter to Maryland. She described the use of death certificates, newspaper obituaries, funeral programs, and inscriptions to document Maryland facilities that included burial grounds. These included prisons, almshouses, state hospitals, training schools, and quarantine stations. Both speakers responded to comments and questions from the enthusiastic audience. Robert Mosko, a monument conservator who has worked on more than 7,000 gravestones in 78 cemeteries thus far, talked about “conservation by the book.” He described factors involved in conducting a cemetery assessment as the hardscape, the landscape, and the administration of the property. He estimated that 30 to 60 percent of needed conservation work in any given situation can be performed by volunteers, and highly encouraged that as a good use of resources and a way to ensure attention from responsible parties. 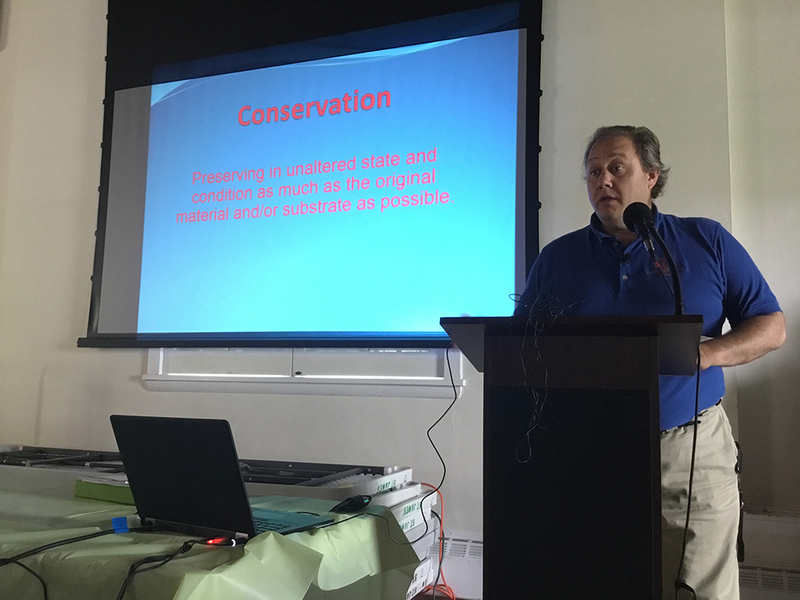 After mentioning the latest technology for burial identification and the usefulness of social media, Mr. Mosko was joined by Dr. Montagna who showed a video of how his office assisted the recently vandalized cemetery at Mount Carmel in Philadelphia. This instructive example highlighted volunteerism, the need for continual maintenance, and protection. Both speakers responded to questions about cleaning markers, use of ground cover, problems caused by gravity and tree roots, etc. 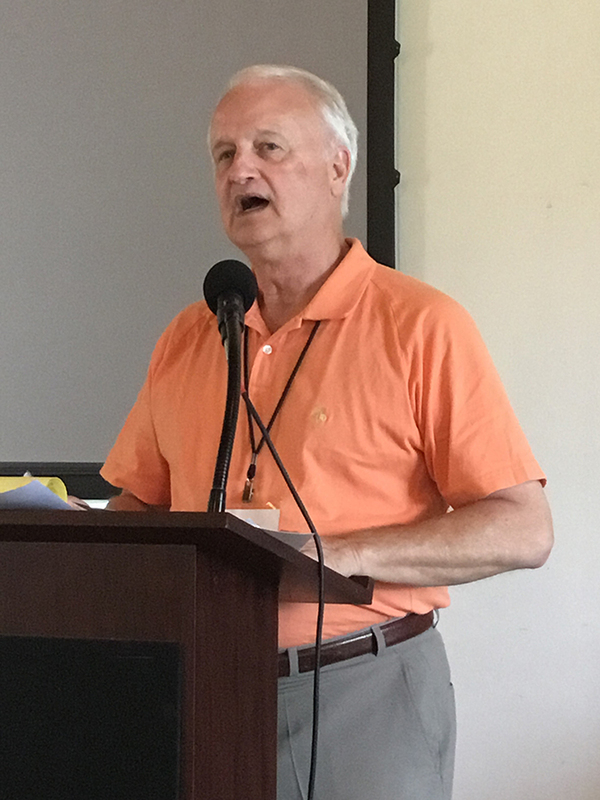 Candy Warden introduced Gary Meyers, the author of “A Pigeon Named Pete,” the true story of a Baltimore legend who is buried in Rosa Bonheur Cemetery. All sales of Mr. Meyers’ book today were donated to the Coalition. 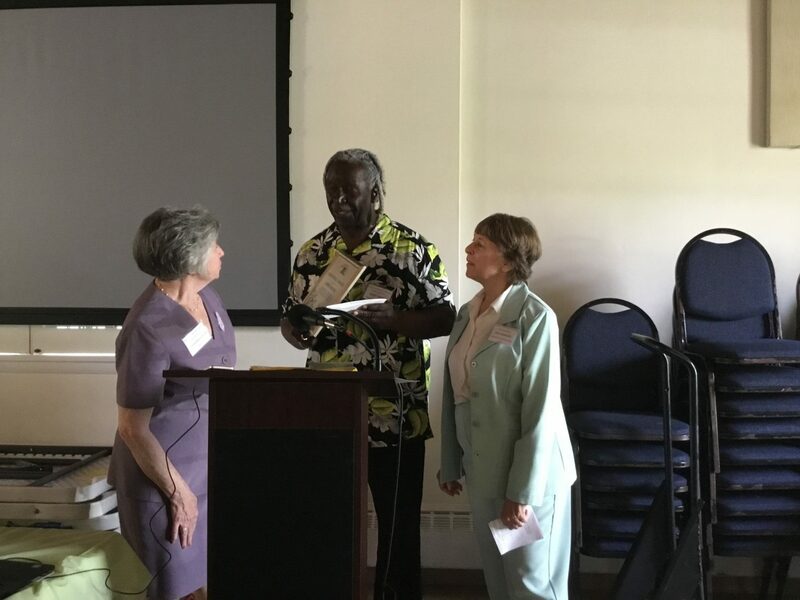 The Coalition honored James Hinds with the 2017 Award for reviving a neglected privately owned commercial African American cemetery. 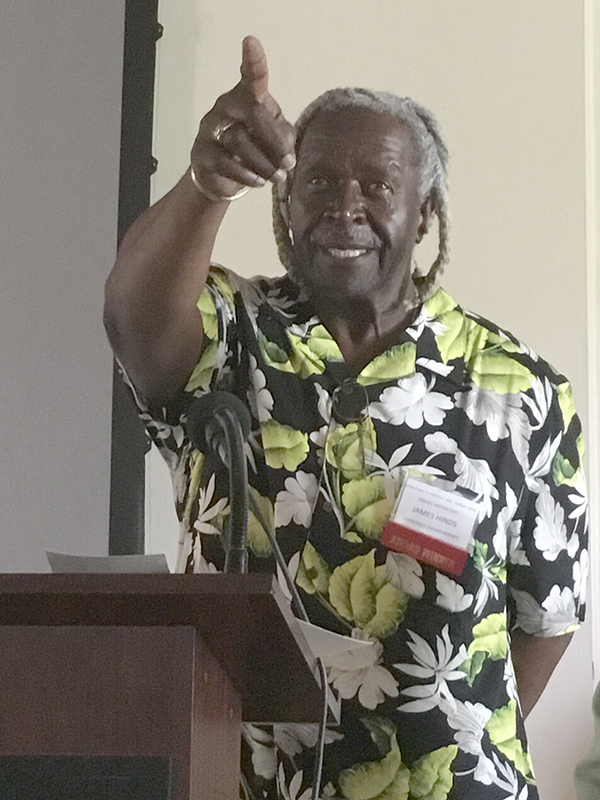 Tina Simmons showed photographs of the cemetery and described how Mr. Hinds returned to Anne Arundel County to take responsibility for Mount Calvary Cemetery and his administrative, financial, maintenance, and community relations progress on its behalf over the past two years. During lunch (catered by Creative Cuisine), attendees described their specific cemetery situations… concerns, interests, accomplishments, help needed. This generated considerable suggestions, offers of assistance, and networking around the room and for the rest of the day. Attendees also visited the silent auction offerings organized by Sandra Wright, the gift shop organized by Amanda Becker, and Gary Meyers’ display about Pete the Pigeon. 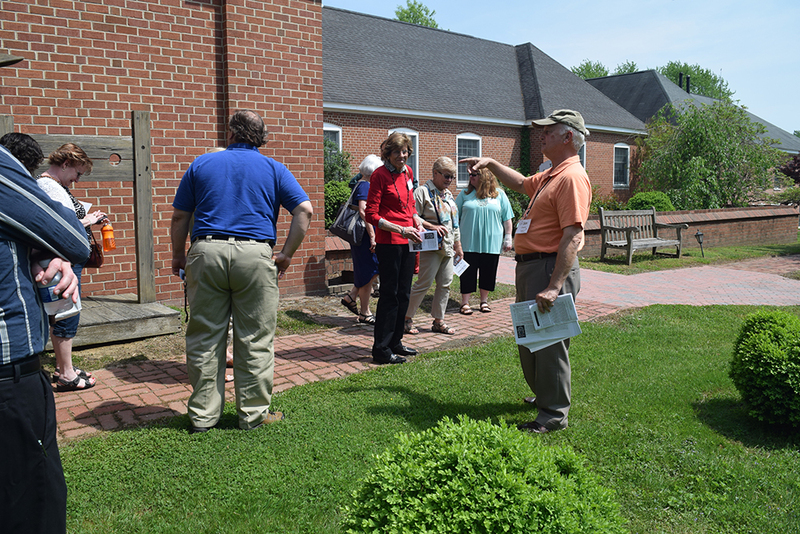 James Cheston, supervisor of St. James Parish Cemetery, talked about the history of the property and then conducted a tour of the colonial church and cemetery. 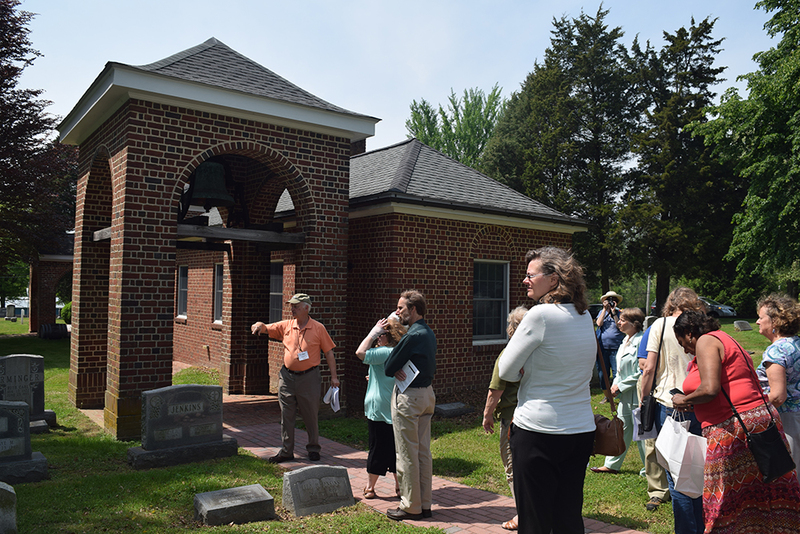 Attendees appreciated the opportunity to learn about the cemetery and to talk about conservation and administration issues. 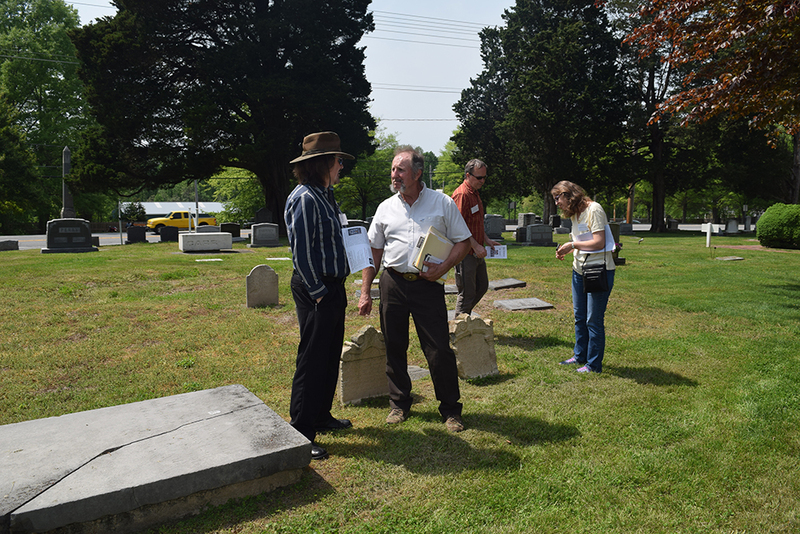 The 2017 Annual Meeting was adjourned at 3 p.m. Attendees left with evaluation forms to complete, “I Break for Old Graveyards” bumper stickers, and smiles on their faces.